37 years later a GT40 passes the same spot – not much has changed!! Sitting on a bench in Valentino Park, maybe the one Enzo Ferrari sat on in 1921 when he discoveredthat Fiat would no longer employ him. 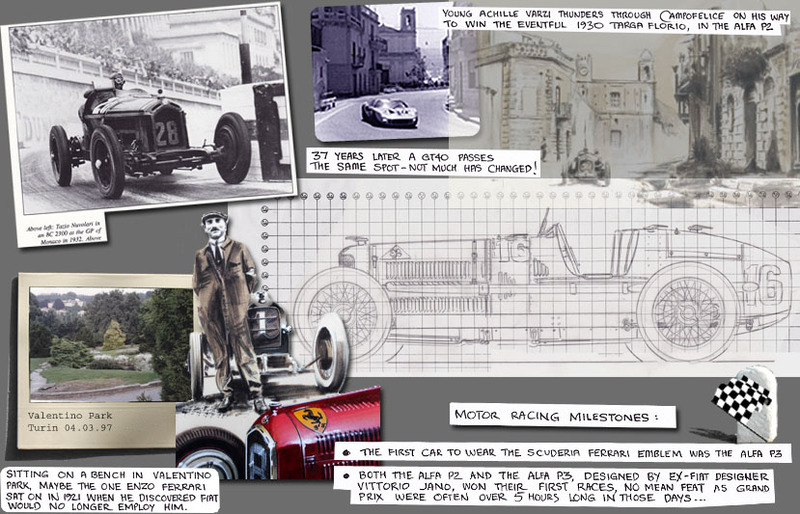 Motor Racing Milestones: •	The first car ever to wear the Scuderia Ferrari emblem was the Alfa P3. •	Both the Alfa P2 and the Alfa P3, designed by ex-Fiat designer Vittorio Jano, won their first races – no mean feat as grand prix were over 5 hours long in those days! !